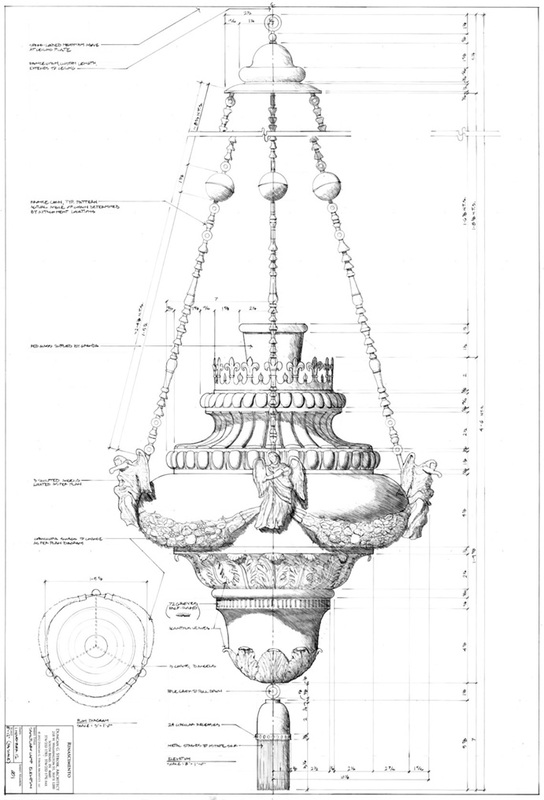 When one thinks of architects one naturally thinks of buildings, but many architects also pursue the design of liturgical furnishings. 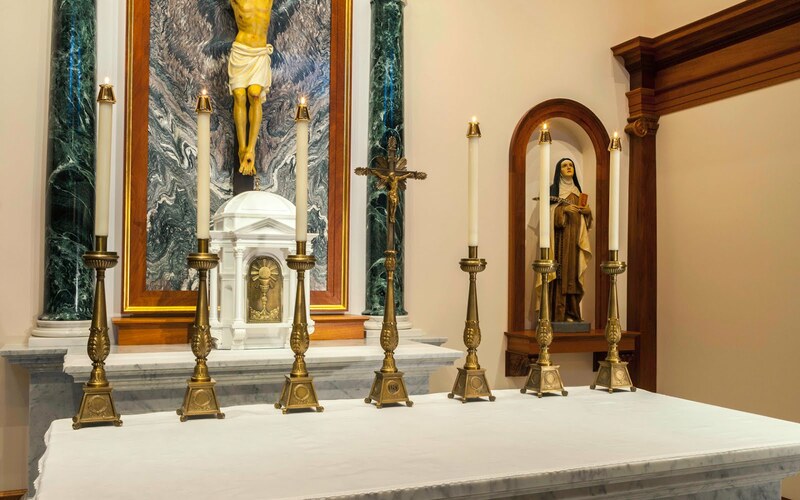 One such architect is Duncan Stroik who has designed a complete set of sanctuary furnishings that includes a tabernacle, candlesticks, altar cross, processional cross, sanctuary lamp, ciborium and chalice. These liturgical furnishings are made and sold by Granda Liturgical Arts. One of the things I find particularly appealing about these furnishings are their strong classical design elements. As well, they are at one and the same time very traditional and yet they also have a certain originality and uniqueness to them insofar as they move beyond the mass produced designs that we are typically accustomed to seeing today. Over the years, I have sought to recover the idea of the tabernacle as the ark of the new covenant and relearn the rich tradition of its design. What is a worthy temple for the God who offers Himself for our salvation? When the Body of Christ is reserved within it, the tabernacle becomes the dwelling place of the Creator of the Universe. Even though the tabernacle is the smallest element inside a church, it holds the full grandeur of God. The Rinascimento tabernacle is in the form of a tempietto, or little temple, with a dome, composite columns, constructed out of the finest marbles and metals. It is intended as the focal point of a church, whether new or existing, and its classic style can fit into both traditional and modernist churches. In order to make clear its connection with the altar of sacrifice it is constructed in marble. 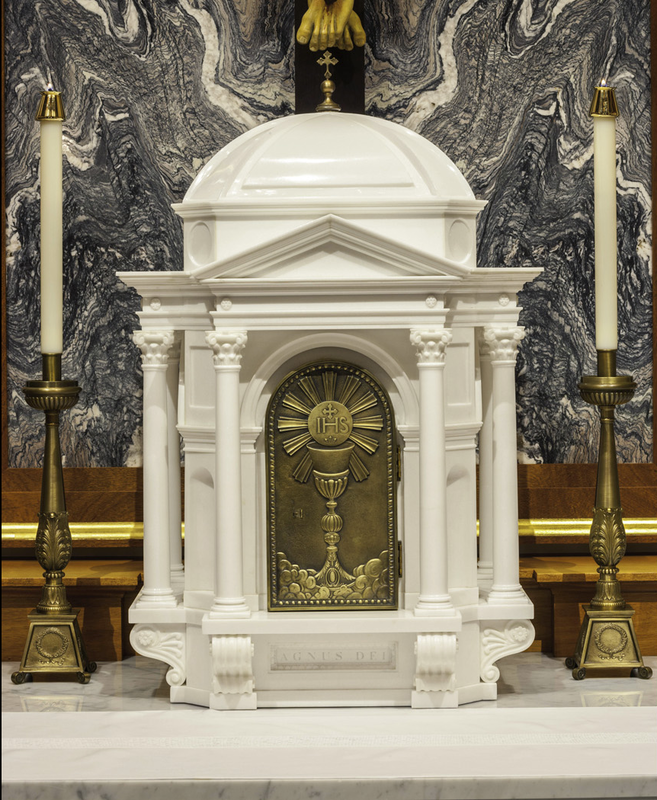 White marble symbolizes purity, and allows the tabernacle to appear as a jewel in the sanctuary. The Rinascimento tabernacle draws upon the classic design of the centralized church, first seen in the Church of the Holy Sepulchre in Jerusalem and revived many times thereafter most importantly during the Italian Renaissance. Like the great centralized churches, the tabernacle is covered by a dome, and is seen as the house of God. The eight-sided shape references the baptistery and the parallels between new birth and Eucharist. The dome shelters the manna from heaven, while the composite columns on each side reinforce the tabernacle’s central importance. As the richest of the classical orders, the composite is associated with resurrection and triumph. The pediment emphasizes the temple-like qualities of the Rinascimento tabernacle. Medieval and early Renaissance wall-tabernacles inspired the use of the pediment in its framing of the door, which is the threshold to the Holy of Holies. Like the Holy of Holies in the Temple of Jerusalem, the tabernacle can be veiled at the door, offering an additional sense of mystery. Traditionally, the door is the area for iconography, and the image of host and chalice is there to reinforce the centrality of the Eucharist reserved within. 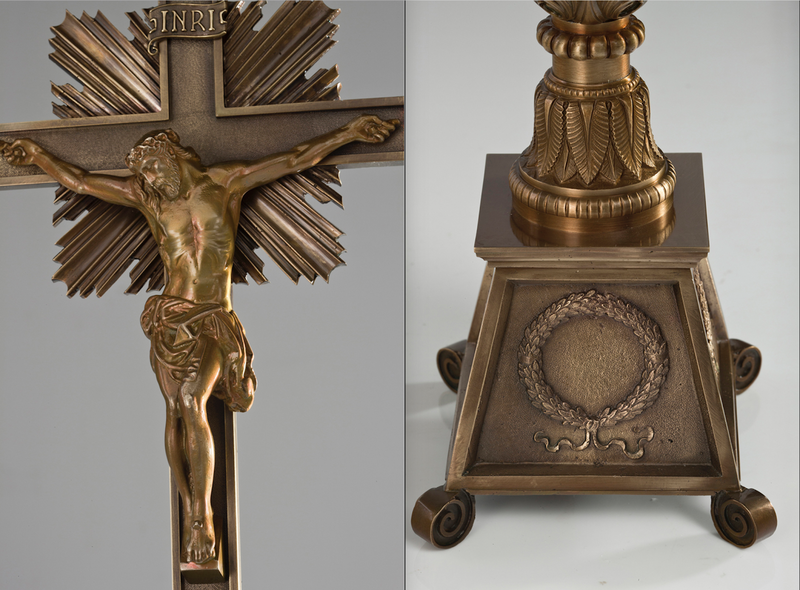 This tabernacle is also a type of treasure chamber and brackets below help to make it visible and prominent. For more information, see Granda Liturgical Arts.